The Omar Qudrat campaign scandal is growing daily and hitting the media now. Qudrat still refuses to answer simple questions about where he lived before he recently moved to San Diego and launched acarpetbagger campaign for Congress in the 52nd District. Up until just a few months ago, he lived in eitherLos Angeles, Washington, DC, or New York – he won’t say. His private vehicle is still registered in Washington, DC. And we have found no evidence that Qudrat has ever voted in California, despite being 36 years old (and of voting age for 18 years) and telling everyone he is from Southern California. country, some of whom are supporters of The Muslim Brotherhood and CAIR, according to high level government sources. drills, etc. Military Veterans who run for elected office are normally very open about their current service; Qudrat is not. Now Qudrat is telling Brett Winterble (off air) and others that he wants to sue Captain Joseph John (former FBI Agent) for “slander”, but he refuses to say which claims are false and slanderous. I asked Qudrat to his face on May 4th at the GOP Convention which published claims are false and he refused to answer and just walked away. That is not exactly the conduct of an “honorable veteran”, but more like the actions of a fraudulent candidate who has been caught in his lies and deception. The question is why and what is he trying to hide? Listen to the podcast here from the 5pm story Wednesday, May 16th on 760 AM. The Omar Qudrat segmentstarts at the 3 minute mark and goes to the 30 min. mark. The first 10 minutes of the segment is Roger Hedgecock raising the unanswered questions about Omar Qudrat that have been raised by numerous groups and citizens over the past 6 weeks or so. Roger slams Qudrat for refusing to come on Brett’s show to answer all of the important questions raised about his campaign. Qudrat was on the Mike Slater show yesterday afternoon for 9 minutes talking about his campaign, but he never once mentioned any of the unanswered questions above. It was “campaign day” on the Slater show yesterday and numerous candidates called in to talk about themselves. Omar Kamal Qudrat is running for Congress in the 52nd Congressional District; his official residence over the last 10 years has either been in New York, LA, or DC, (we were misled on the phone by his staff, when we asked for his previous legal residence; however his auto is registered in DC). We rejected providing any support for Quadrat, because of his staff’s repeated refusal to tell the truth, and tried to cover up where he came from. Over the last 9 years, being truthful has been the absolute bedrock requirement for anyone to be considered for endorsement by the Combat Veterans For Congress – Omar’s staff initiated the relationship by lying. At the end of last year, Omar Kamal Quadrat moved into a high rise apartment building on 9th Avenue, in downtown San Diego. Omar Kamal Quadrat receives donations from some supporters of the Muslim Brotherhood and CAIR. It is obvious, in the May 5th “Times of San Diego” article, that Omar Kamal Quadrat will not support a Border Wall to seal the wide open southern border. 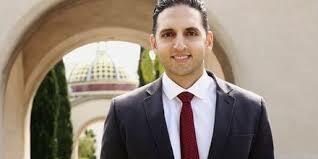 Omar Kamal Quadrat has never voted in California, and he is not a member of the California Bar. We consider both Omar Kamal Quadrat and John Renison Rosas carpetbaggers whose support for voters in San Diego is questionable, because they don’t know anything about the problems facing American Citizens in San Diego County, and know very few San Diegans. Most of their donors are not from San Diego, and some of Renison Rosas’ donors, south of the border, have questionable associations. Qudrat has a national fundraising office, soliciting donations from supporters in all 50 states, including from supporters of the Muslim Brotherhood. We request that you forward this article to as many voters in San Diego County as possible, to provide them with the backgrounds on Omar Qudrat and John Renison Rosas – something many members of the Central Committee, Tony Krvaric, and Carl DeMaio who endorsed them have not done. Muslim Brotherhood and CAIR, according to high level government sources. One Comment on "San Diego. Muslims running for political office as a Republican."